Phillyweather.net: Potential Record Cold High On Sunday? Potential Record Cold High On Sunday? The shot of cold that's pushing in tomorrow will bring us the coldest air we've seen in a while -- our first sub 40 degree days for the cold season plus a biting wind. It'll feel more like January than November. As you can see on the map below, the push of chill is pretty significant for Texas and the Plains, bringing them their first taste of substantive cold so far this autumn. All of that pushes east for us starting tomorrow. Saturday's highs look to be reached in the pre-dawn hours -- and it could be still modestly mild by November standards as the front slides through in the hours before sunrise. It won't be that mild in the afternoon as temperatures slowly drop or hold steady through the course of the day with a northwest breeze kicking up. By Saturday night, 30's take over and we probably don't get out of the 30's until some point on Tuesday. Sunday is setting up as the coldest of the upcoming cold shot -- potentially record setting from a coldest high standpoint. The record cold high for Sunday is 34, set in 1956. Modeling suggests low to mid 30's, at best, for a daytime high. That's not including a wind chill that will knock another several degrees off of the mark. Sunday night into Monday could produce a near record low (21 is Monday's record low) for Philly as well. 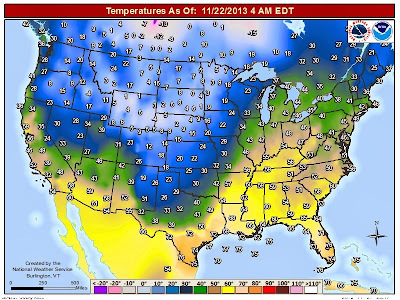 That 21 might be tough with the "heat" island to knock out but the possibility of getting down below 25 is quite high. So, with today's relative mild weather...enjoy it given that 48 hours from now, we will probably be struggling to be much above freezing here in Philly.